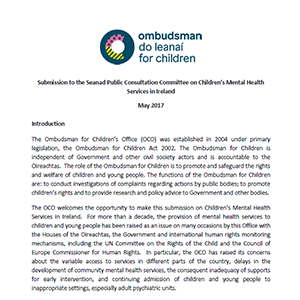 In May 2017, the OCO prepared a submission to the Seanad Public Consultation Committee on children’s mental health services in Ireland. Included in this submission are recommendations relating to the development of a new, stand alone, comprehensive Government strategy specifically addressing the mental health needs of all children and young people; the recognition of children’s right to child-centred and quality mental health services at a statutory level; the development of universal, accessible and evidence-based, prevention and early intervention mental health services at a community level; ending the practice of admitting children to adult psychiatric units as a matter of urgency; and the establishment of a mental health advocacy and information service that is specifically for children, and accordingly accessible and child-friendly. The Ombudsman for Children, Dr Niall Muldoon, appeared before the Seanad Public Consultation Committee in July 2017 to discuss children’s mental health services and outline these recommendations.